Those of us who work with books and documents have long sought after something that would avoid the kind of damage that water itself can do. Taken all in all, water and wet have destroyed more documents than fire ever has, a fact that sometimes crosses our mind when we look out at Dorchester Bay just next door. But water does its damage in stages, and recovery is possible. Fire destroys quickly and permanently. Mostly the alternatives involve gaseous systems that suffocate a fire in one way or another. These systems are effective and frequently ingenious, like the method that reduces the concentration of oxygen in a building enough so that a fire is smothered before it starts, but not so much that it smothers any living occupants of that building. So why wouldn’t you use one of these techniques? Well, for one thing, not every system is so harmless to living creatures. And a few have been shown to do nasty things to the environment. But mostly what they are is complicated. They need to be configured in special ways, and frequently the buildings they are in do too. Any increase in complexity brings in added possibilities of failure. Furthermore, the gases involved are necessarily a limited charge. If you run out of gas before you run out of fire, you have a problem. Water-based sprinkler systems on the other hand tend to be simpler and more reliable, with limited environmental effects, and liable to do no more than give you a good wetting if you get caught by one. Also, in most circumstances it’s hard to run out of water. And it’s not as if sprinkler systems haven’t become more sophisticated. Most people have an image from the movies, where somebody sets off one sprinkler head, which causes them all to go off (a thriller if it’s done purposefully, a teen comedy if it happens by mistake). But modern sprinklers work semi-independently, with only those heads activated that are close enough for the fire to trigger. And other changes are being introduced, including systems that use less water, but turn it into a penetrating mist. In the end, as with any effort at damage control, it’s a matter of risk analysis. 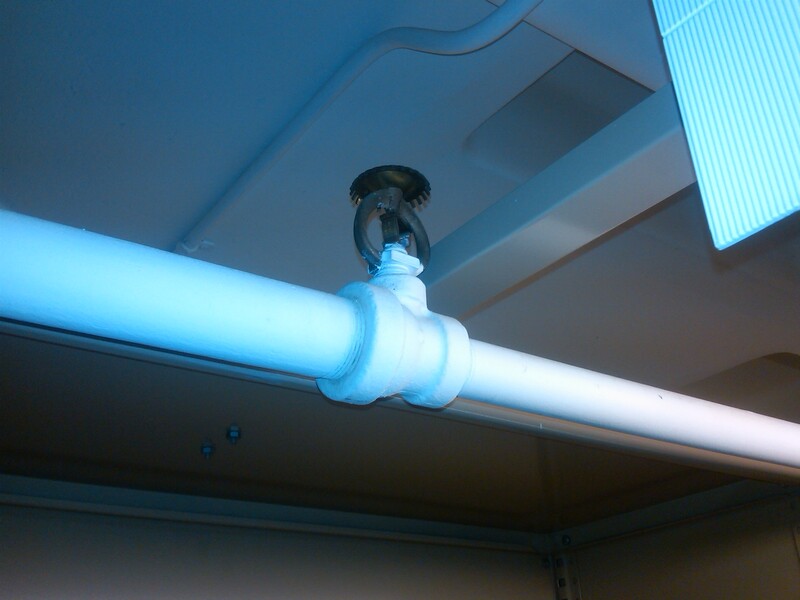 For our purposes, in our repository, our sprinkler system is the best way to go. It just needs reinforcements, and a few equipment changes. While that work is happening we have to pack all but one of our textual collections out of harm’s way, and keep them that way until we’re sure the system is glitch-free. *Okay, not ALL of our stacks. Our audiovisual materials and the Hemingway collection will remain open. And we have found a corner to put our National Security Files in so that they remain accessible. Also, of course, folks can always see our digitized archival materials through our website.